It’s been thirty-five years since the inaugural Powell Street Festival, and in that time we’ve grown from a small community event to a full-blown arts & culture celebration attended by thousands each year. We are grateful to all the participants, volunteers, funders, attendees, and our DTES community for supporting our efforts these past thirty-five years, and we look forward to at least thirty-five more. 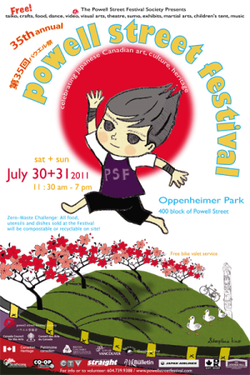 In the meantime, we look forward to welcoming you to Oppenheimer Park for the 35th Annual Powell Street Festival! For programme and full-schedule information please follow the link here.